After four years of testing, food startup Hampton Creek has finally released its vegan egg product, Just Scramble. Well, in one restaurant, anyway. Flore, a brunch spot in San Francisco's Castro district, started serving a dish that uses the plant-based product this week. It's the only place publicly selling Just Scramble at the moment. Hampton Creek founder and CEO Josh Tetrick says it will be in more U.S. restaurants by the end of this year and in fast food chains starting in early 2018. Just Scramble is a light-yellow liquid that congeals like a real egg when exposed to heat. It can also be used in baked goods and other dishes. Its primary ingredient is mung bean protein, though it also contains water, oil, salt, pepper, black onion, and acid. Best known for its vegan mayo, Just Mayo, Hampton Creek also sells cookie dough and salad dressings in stores like Whole Foods, Kroger, and Walmart. The company plans on selling Just Scramble directly to restaurants for now, and to consumers through grocery stores by the end of 2018. For a company best known for producing a version of the blandest condiment, Hampton Creek has been a surprising magnet for drama. Its entire board of directors, minus Tetrick, resigned in June amid rumors of clashes with the founder. Target announced it would no longer sell the brand in August, citing food safety allegations. The company was briefly under investigation by the government after a Bloomberg News story alleged it artificially inflated demand for its mayo with fake shoppers. It has been sued by competing mayo makers and Jaden Smith over product names, and tangled with the FDA over health claims and its use of the word "mayo." If successful, the new egg substitute could be a palette cleanser for the company, which has raised around $245 million. It announced a new round of funding led by Radicle Impact and Blue Horizon on Thursday, but did not disclose the amount. 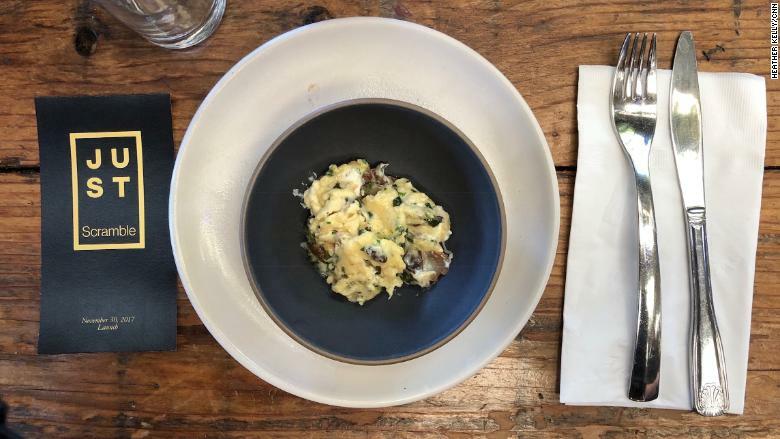 Hampton Creek held a small breakfast on Thursday so members of the press could taste the final version of Just Scramble. Chefs from Hampton Creek whipped up a dish with mushrooms and goat cheese, as well as a plain version. When cooked, the texture is incredibly similar to a real scrambled egg, though a touch grainier. When mixed with other ingredients it's probably close enough that anyone who didn't know would assume they were eating a regular egg. On its own, there is a slight earthy aftertaste. For restaurants, how it performs in the kitchen is as important as the taste. Just Scramble cooks as quickly as real eggs without any unusual odors. Each bottle of Just Scramble is the equivalent of about 7 eggs. The form factor is familiar to restaurants, where it's common to use buckets of liquified eggs to make everything from omelets to cakes. Tetrick said the company struggled with early prototypes and went through thousands of test recipes before it hit on the final formula. Its food scientists tried various beans and plants, including soy and pea protein, the key ingredient in other vegan eggs. Some batches would evaporate, others wouldn't coagulate at all. A few tests looked great but tasted terrible. Mung bean protein turned out to be the best candidate for taste and texture. Mung beans are a popular ingredient in many Asian foods. Hampton Creek is currently getting its supply, which isn't organic, from existing mung bean farms in China. But it touts the crop as an environmentally friendly alternative to poultry farming because it uses less water and results in lower greenhouse gas emissions. Founded in 2011, the 130-person company is also working on making lab-grown meats from real animal proteins. Its goal, according to Tetrick, is to provide more environmental alternatives to meat that will appeal to regular people, not just vegans and vegetarians. "At the end of the day we've found there's a limited number of things consumers are thinking about, led by, 'Shut up, does it taste good?'" said Tetrick. "Does it taste good, does it make me feel good and can I afford it?" Hampton Creek did not disclose its price per 322-gram bottle, but says it will be comparable to premium cage-free organic eggs. There are plenty of other egg alternatives on the market, but it is still a niche category mostly relegated to health food stores. U.S. consumers eat more than 76.5 billion eggs a year. That's a huge opportunity for any company that can make the idea of faux-eggs appeal to mainstream consumers. Correction: An earlier version of this article reported Hampton Creek raised $220 million.